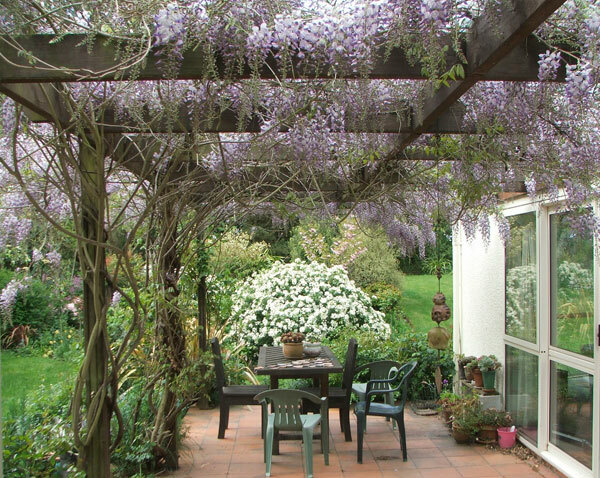 The Wisteria was planted to grow up and over the house patio pergolas, replacing a pair of rust-prone New Dawn roses. It's a delicate pale purple shade when in flower - but what a beautiful fragrance! I'm a Wisteria novice, and sitting underneath in spring is even more joyous than I'd imagined. I just didn't know that the flowers were so beautifully perfumed. Of course the green leaves form a great canopy for summer on the patio, and the golden autumn colours seem to last and last. Then they're so well-behaved, all seeming to fall down at once! This is convenient for the sweeper of the house patio (me). The winter sun can easily reach the house through the bare twisty branches. That's every season covered! Oops. We won't talk about correct pruning... I do it when I remember. Not really good enough! How much should I prune it? When will it flower? Will it grow into a monster and be another of my gardening disasters? 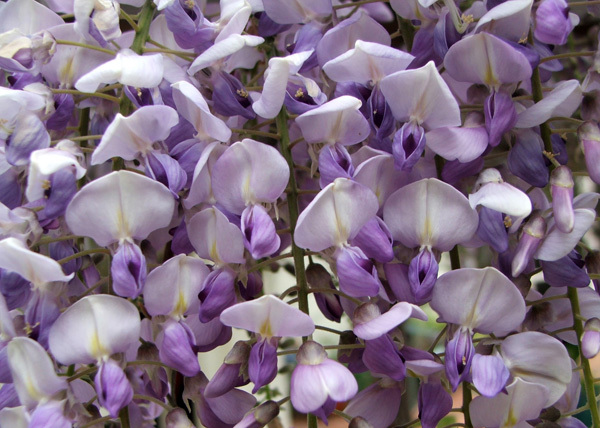 Wisteria is the type of scary plant which affects my gardening self esteem. How much should I train it? Clockwise, or anti-clockwise? Should I cut off the floppy tendrils which are appearing now towards the end of summer? Aargh! The ridiculous thing is that I am an intelligent gardener with more than adequate research skills. I have books and magazines in which all the answers to all my Wisteria questions will undoubtedly be answered. So why do I stare at this ever expanding plant and feel so hopeless - and nervous? Enough of this nonsense. My Fine Gardening magazine has an article about pruning Wisteria (twice a year, if I remember correctly). 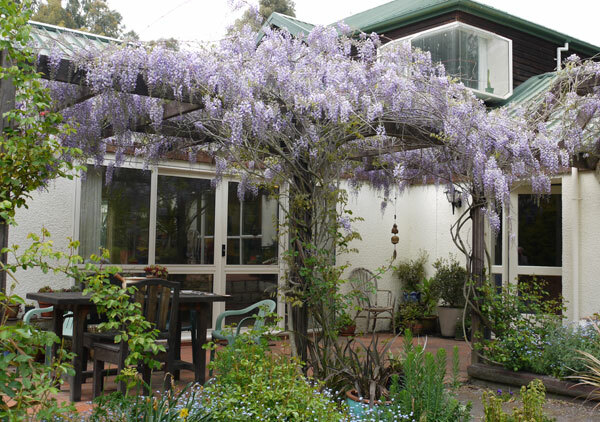 It should be immediately obvious if my Wisteria is Japanese or Chinese. I'm sure it will flower, given time. And just suppose it gets too big - well, there's always the chainsaw! 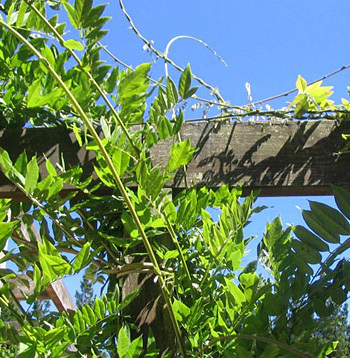 In the spring of 2012 the Wisteria didn't work at all. I mean that none of the buds opened. I waited and waited. Eventually things looked rather dead, and I sadly chopped it back to near ground level. But wouldn't you know? New shoots started appearing from the base, plus countless little seedlings were growing in the patio garden. Watch this space!